Good morning everyone! You might have noticed already, but I’ve been really into health and wellness lately. Not only have I been eating super clean, but I’ve been using cleaner beauty products, as well as watching all sorts of YouTube videos and reading books about meditation, de-stressing, and the benefits of an established self-care routine. You’ve probably heard of cortisol but if you haven’t, it’s commonly known as the “stress hormone” and is produced by the adrenal glands when you’re under pressure and receive a threat. Your body naturally produces the most cortisol in the morning, and your cortisol levels are supposed to taper off through the day and evening – wearing off just before bed. However, this is not the case for a lot of people! Have you ever found yourself laying in bed, WIDE awake and stressed out? When we’re chronically stressed, the body releases cortisol at all hours, even at night when it’s supposed to be at it’s lowest. This is what happened to me – I found myself feeling incredibly tired in the morning, but by nighttime I would feel wired, stressed, and working late into the night. I’m trying to restore my cortisol levels back to normal (cutting out coffee has helped a ton!). One thing that really helps me relax at night is practicing a self-care routine – almost like a pampering spa night, but in the comfort of your own bathroom! 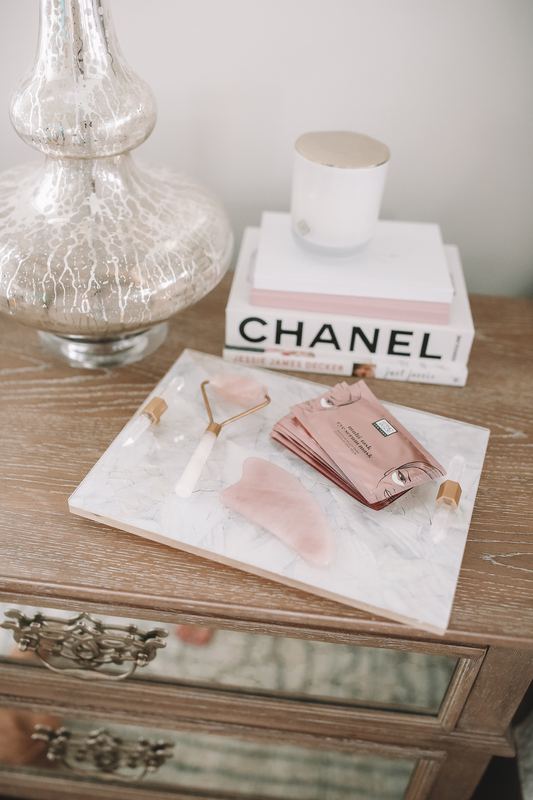 Read on for my very favorite products (all from Nordstrom) and how I’ve incorporated them into my weekly self-care routine. 8pm – I try to get finished with all of my work by 8pm, otherwise I have the tendency to work late into the night! I start by shutting my computer and turning my phone on airplane mode. What’s even harder is turning your brain off – anxious or worried thoughts might try to seep in, but you have to be conscious of them, acknowledge them and let them go (practicing meditation really helps with this!). The next step is my favorite: taking a hot bath! 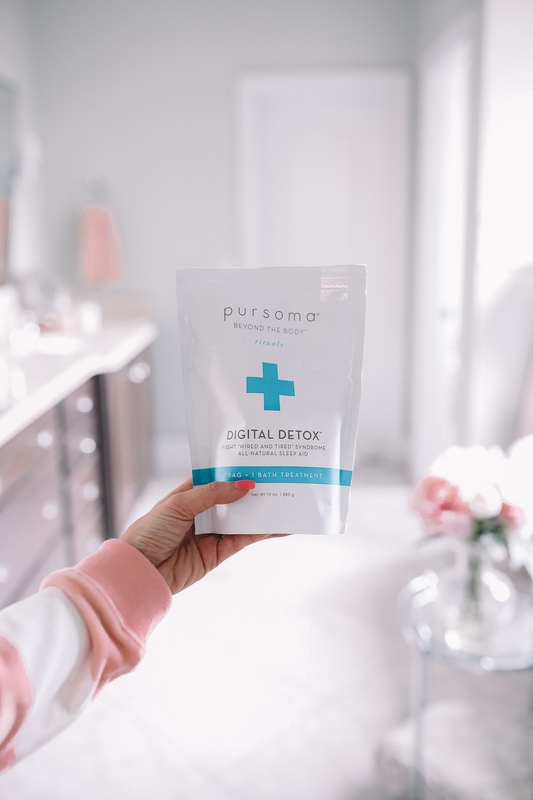 If you REALLY want to relax, you need to try this Digital Detox bath treatment. I was curious to try this because I saw it on Nordstrom’s site, but it didn’t have any reviews yet! It is expensive, because you have to pour in the entire package into the bath for the treatment, however, it really does work. I have NEVER felt more relaxed than after a bath with this stuff!! The treatment contains a mixture of French green clay paired with French green sea salt and is supposed to stimulate detoxification, as well as help relieve stiff joins and muscle cramps. It doesn’t have a scent, so I like lighting some candles around the tub to help with the ambiance. But I swear, I felt so relaxed afterward, my skin felt really soft, and the next day I woke up feeling less bloated. 8:30pm: After a really nice, relaxing bath, I’m ready for my skincare routine. I do a certain little skincare routine every single night, but on nights that I really want to pamper myself, I add in some “extras,” including a facial massage! Sounds luxurious, doesn’t it? And you don’t have to pay loads of money for it! After cleansing my face and using either a rose quartz facial roller or this crystal gua sha, I do a short facial massage on myself with my favorite serum. If you haven’t used one of these before, I definitely recommend checking out some YouTube videos before. The trick is to always massage your face upward and outward, and never down. So what’s the difference between the facial roller and a gua sha? 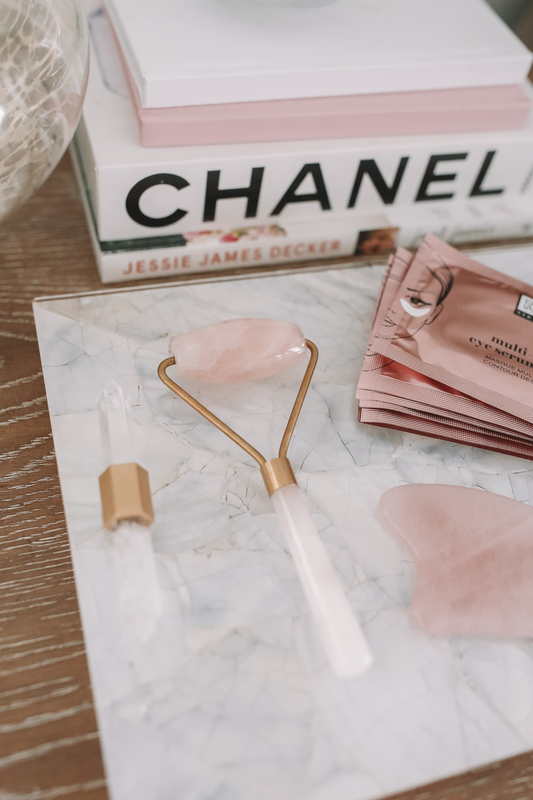 Both products feel really nice on your skin: the facial roller is easier to use and requires less time, but the gua sha goes a little deeper to release muscle tension, and is so effective it’s been called “natural botox” for your face! Both increase some level of lymphatic drainage in the face, which can temporarily reduce swelling. 8:45pm: The last thing I do in my self-care skincare routine is to apply an eye serum mask. You can definitely do these in the morning for a boost, but I find that I never have time in the morning; therefore I like to do them at night! 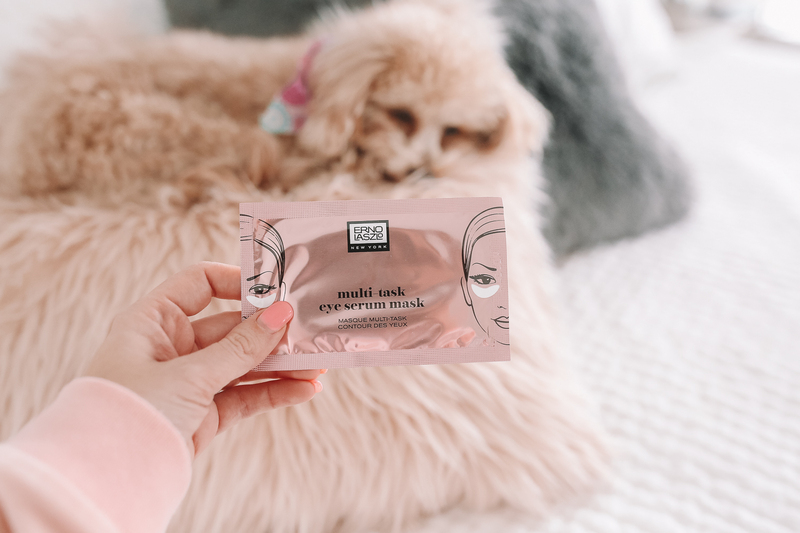 This particular eye serum mask by Erno Laszlo contains algae extract, vitamin B3, amino acids and allantoin to give immediate results to the under eye area. One of the reasons I really like them is because they’re cooling – and they feel sooo good on tired eyes! I put them on and set my phone timer for 15 minutes, then usually get in the bed and Chris and I will start watching a TV show. 9pm: The last thing in my self-care routine is to make myself a calming bedtime drink! 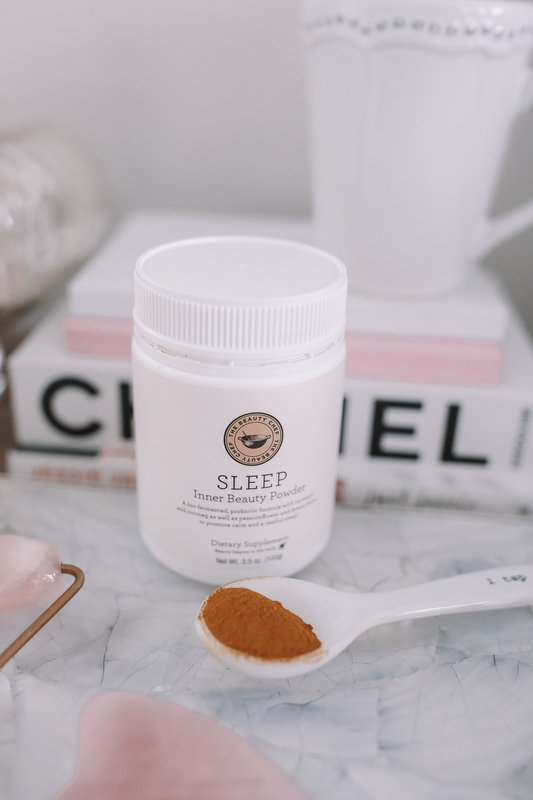 You guys already know I love drinking chamomile or sleepytime tea at night, and I recently started alternating between tea and this Sleep Inner Beauty Powder. I was a little hesitant to buy a powder that helps with sleep… until I read the ingredients! It’s completely natural, containing turmeric, cinnamon, lemon balm, ginger, black pepper, cardamom and nutmeg, to name a few ingredients. I like to warm up a mug of almond milk and mix in one teaspoon of powder and a tiny bit of manuka honey to sweeten it a tad. I try not to use this every night so that I don’t become dependent on it, but nights that I do use it, not only does it help me fall asleep but it also helps my anxiety seem to float away! The best thing is that I get a full night of sleep and wake up the next morning without feeling groggy. 10pm: Chris and I like to watch TV or I like to read in bed, but by 10pm it’s lights out for us! Wow I feel like such an old person saying that hahaha, my college self would stay up until 2 or 3 a.m. every night! But I feel so much more refreshed when I go to bed earlier, and I also wake up in a good mood and ready to be productive. I’d love to hear if you have any self-care routines or specific products that make you feel pampered! 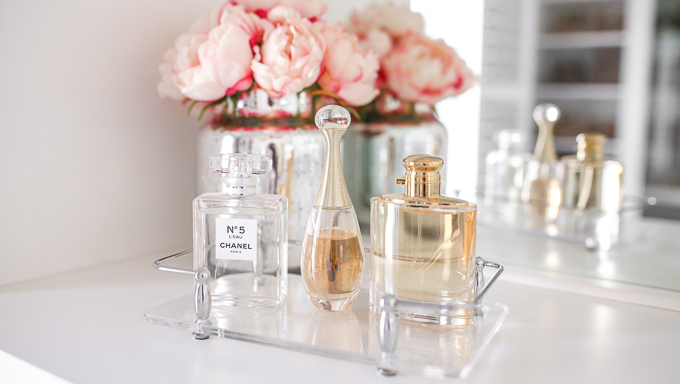 All of the products I mentioned above can be purchased from Nordstrom – did you know that they have an entire section of their website dedicated to natural beauty and wellness? For a full list of beauty products that are guaranteed free of sulfates, phthalates, parabens, petrochemicals, mineral oil, silicone and talc, you can click here. Loved reading this Cait! I definitely want to try a facial roller this year. And I’m with you on the early bird thing… I rarely went to bed before 2 in college, what a time! Where is your bathtub stand from? I just moved and have been looking for a cute one! Thanks! I started using a jade roller in December and I love it so much! It’s so relaxing at night and then I use it right out of the freezer in the morning to “wake” my skin up! I’ve always wanted to try a facial roller, but was hesitant about it. I never knew if they really worked! I’ll definitely have to check out some YouTube videos and look into getting one. Your outfit is absolutely adorable! You look super cozy and ready to curl up with a warm blanket! Honestly, I want to try every single one of these! Thank you for the introduction to them Caitlin! I loved Reading this! So interesting reading about your cortisol levels decreasing throughout the day! I must say that I don’t really Suffer from stress Right before bedtime, but I have to get in a Little Bit of gym Time in the evening or a quick run! That completely calms me down and relaxes me! I need to get myself one of those jade rollers and I’m tempted to try the Digital Detox bath salts! I had no idea that Nordstrom has a section dedicated to natural beauty & wellness. One of my goals in general (not just for the new year) is to incorporate more natural/clean products to use in my daily life. I’m definitely feeling inspired after reading your post! Thank you for sharing! 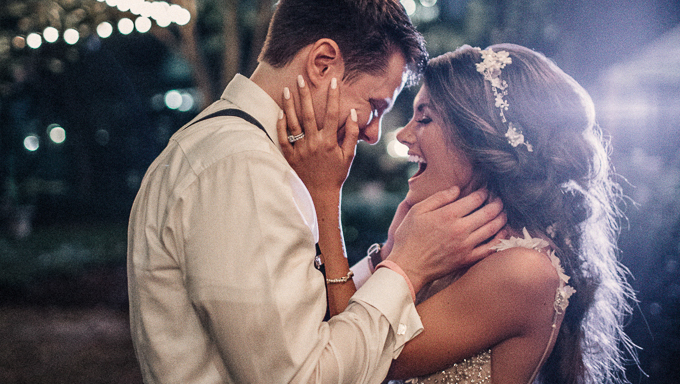 Caitlin – great post! I’m starting all my days with movement through a 20 minute yoga stretching and moving session at home. I am feeling more energized and focused throughout the day, and my body is already showing signs of getting more lean and long. What has really been amazing, however, is my meditation practice which I started at the beginning of 2018. I use the app “Headspace” which as millions of users because it is THAT GOOD. Headspace is guided meditation and there is something for every need – sleep, reset, energize etc. You can choose to meditate for one minute, five minutes or more – whatever you have time for. I tried so many methods for getting into meditation and failed at all of them until Headspace came into my life. Now I look forward to meditating! 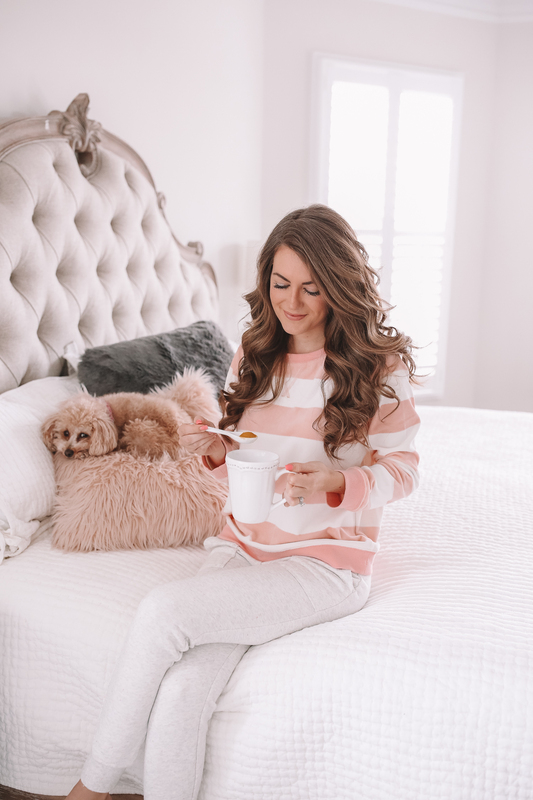 Loved reading all about your relaxing nighttime routine! I’m definitely going to look into that facial roller. My favorite bedtime routine is to make a smoothie with collagen in it; collagen has natural occurring melatonin so I think it helps me fall asleep! I am obsessed with the crystal gua sha and feel like it works better than the jade roller because of the curves. I would recommend keeping it in the fridge. It feels so good on the face when its cold! 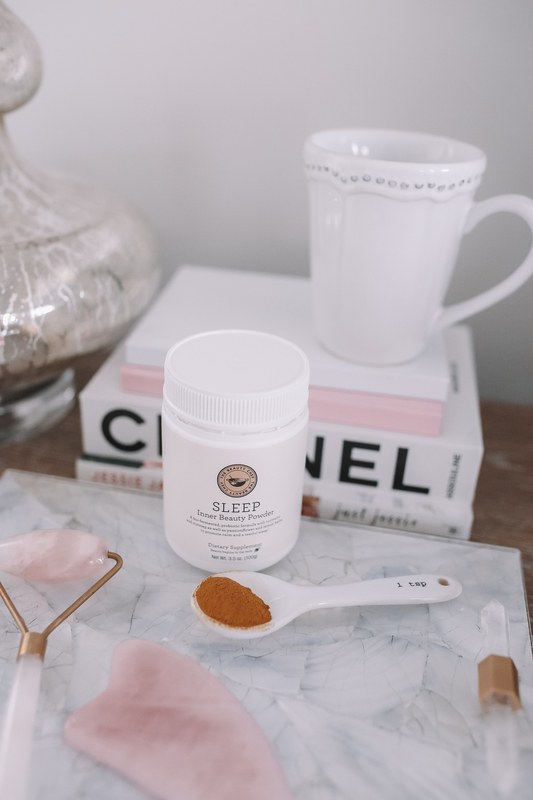 I want to try the sleep inner beauty powder! Does it taste good? And going to check out the Nordstrom beauty site! Never knew they had a natural wellness and beauty section. SO cool! This is such a helpful post Caitlin! I have to admit that my skincare routine is definitely NOT what it should be, but as I’m getting older, I’m realizing how important it is. I’m excited to try out some of these tips! I loved this post Caitlin. I think having a nighttime routine is so important especially for those of us that suffer with anxiety. The first thing I do when I get home is take off my makeup and do my skincare routine because it just makes me feel like I’m washing the day away. I have a jade roller, but I’m so interested in the gua sha stone you recommended as well as the eye masks!! I gotta try that sleep powder! I’m really curious about the bath detox. I love unwinding with a good bath…and some wine. haha Maybe that powder would be better though. I always try to make it a point to unplug at least an hour before bed from my phone and tv and read. I haven’t been doing so well with the hour timing, so I really need to work on that. Such a lovely post! I love reading about daily routines! Thank you for being honest about dealing with your struggles! This post hits so close to home and I need to be serious about instilling a firm 8pm no more work policy because as a young healthcare professional working out of DC where work is non stop, it’s SO hard to disconnect from all the emails and texts received during the day. What a great pampering routine. Sometimes the little things make a big difference. Great post! I really want to try a facial roller! The inner beauty powder seems interesting I really wanna try it out! Can you please post the link for your bedroom rug? Thank you! that’s so great that you turn your phone on airplane mode! do you turn it on for the whole evening? Love this post! And your blog! 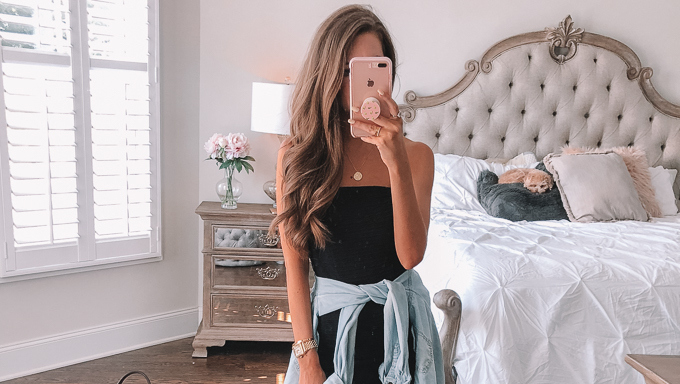 Where is this outfit from that you are wearing!? Love the colors of the sweat shirt and sweat pants!